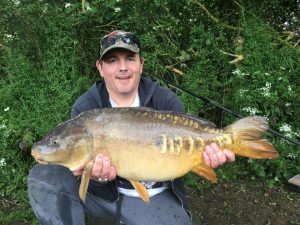 John Maher is more used to fishing for perch and pike but he has decided to give that a rest for a bit and have a go for carp. 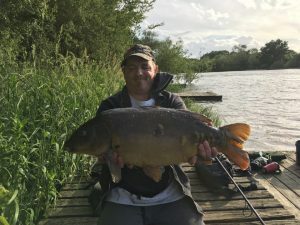 After purchasing all the relevant tackle and bait John was off to Drayton Reservoir for a day session, the fishery has a huge stock of carp and is in Daventry. A day ticket costs £12 for two rods or £8 for one, there is also a good head of roach and perch at the fishery if you fancy a mixed bag. Baiting an area around thirty yards out with Nash crab and krill boilies John waited for the action to start. The morning was quite slow with only a few carp but by the end of the day John had caught a total of fifteen carp with the biggest being 18lb. Considering John is a beginner to carp fishing he feels this was an absolutely fantastic session and is well and truly hooked on carp fishing now saying "the fight is totally different, it's like hooking into an underwater speedboat!!" 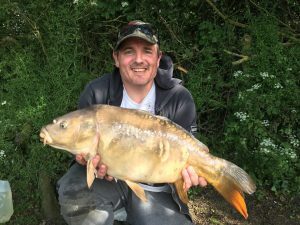 If your a beginner to carp fishing and fancy catching a fish or two then John highly recommends Drayton as the place to go.